Leaving Thursday morning at 5:45, the ThunderChickens gathered to leave for Saginaw Valley State University, where the Michigan State Championship was held. The competition was split into four different fields, Ford, DOW, DTE Energy, and Consumers Energy. After 12 qualification matches, the ThunderChickens were ranked in fifth place, with 11 wins and one loss. The team was invited to join Stryke Force (Team 2767), the reigning world champions, and they graciously accepted the offer. The two teams invited CC Shambots (Team 5907) to join the alliance as well. Together, the teams went on to win the DOW field, bringing home the ThunderChickens their second blue banner of the season. After switching to the DTE Energy field, where finals would be held, there was a two hour delay because of a problem with the Field Management System. Once the break was done and the first match commenced, the Chickens walked off the field with one win in semi-finals. For more information about the ThunderChickens, please visit www.thunderchickens.org and www.thunderchickens.org/blog. 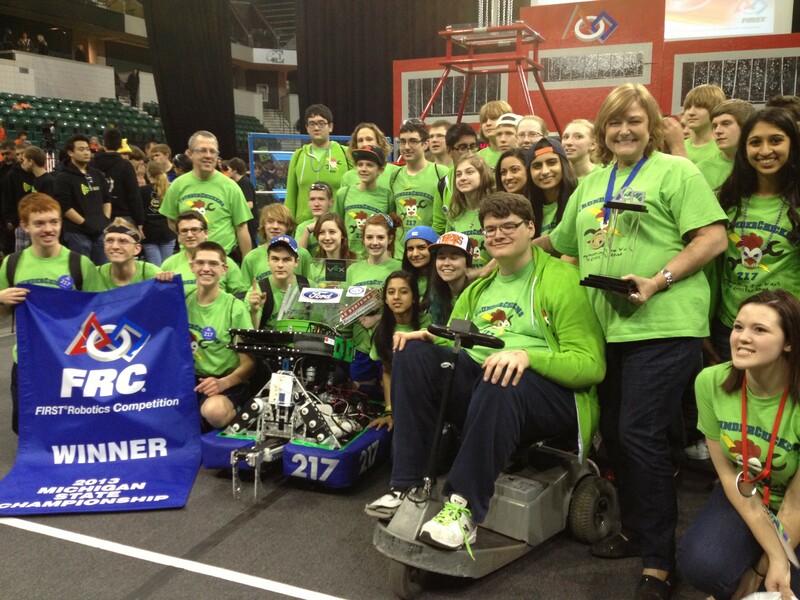 For more information about FRC and FIRST as a whole, please visit http://www.usfirst.org/. For information about FIRST in Michigan, please visit http://firstinmichigan.com/.